CHICAGO — While the chances of a high school kid getting into college can often feel like a game of luck, one tech whiz has sought to mathematically break down a Noble Network student's probability of being accepted and succeeding at college with a series of formulas dubbed "The Robot." "The Robot," sometimes referred to as simply the "bot," uses students' GPA, ACT score and race, stacks it up against data provided by colleges and Noble alumni, and then attempts to predict the student's likelihood of getting into schools while showing the graduation rates for those schools. The bot, which comes in the form of a simplistic-looking, customized Excel document complete with a photo of a 1980s-era robot, also factors in considerations such as financial aid and school location. "We were hoping to find some way to do something with the fact that we knew about which students were getting into which schools," said Noble Chief College Officer Matt Niksch, who developed the technology for the charter network's 14 city campuses a little more than a year ago. 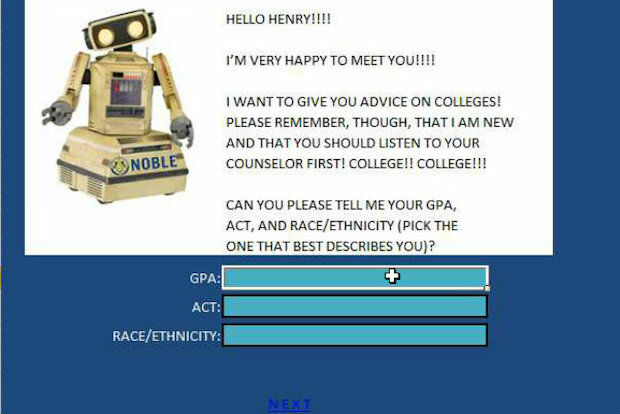 While more comprehensive websites like Collegedata.com are out there to help high school students figure out their chances of getting into college, what Niksch said makes his "bot" stand out is both the interaction the technology has with guidance from college counselors and the way it's tailored specifically for their students. "It's a way for us to have a conversation with our students and our parents," said Caroline Kelly, who works as a dean of college counseling out of Noble's Pritzker College Prep in Hermosa. Kelly, who said the tool is widely used by seniors, noted that it can help take students out of their comfort zone by showing their chances of getting into schools that are far from home. "We have a lot of students that are afraid to leave Chicago, and when they see that there are so many schools out there ... it’s kind of eye opening," she said. The bot also features six-year graduation rates for minority students, a particularly useful tool for a school system that's made up of a majority of black and Latino students. "We have so many students applying, particularly minority students, that we can get a sense for how colleges are going to treat them in the application" process, Niksch said. While the bot is somewhat simple and perhaps less intimidating looking than similar tools — both with the use of a friendly robot and the limited information students need to put in — it also means the technology doesn't factor in considerations like extracurricular activities and difficulty of coursework. "Having that information would help better with the prediction question," said Shlomo Engelson Argamon, a professor of computer science and director of Master of Data Science program at the Illinois Institute of Technology. Kelly and Niksch said the tool is focused on academics and serves to complement a bigger discussion counselors have with kids about things like extracurricular activities or whether they feel they'll fit in at a particular campus. But ultimately, Engelson Argamon said a predictive data model like this one hinges on the network's ability to gather enough information about their students — something Niksch maintains is easy for a giant charter network like Noble. Now, Niksch is turning his focus to how tools like "The Robot" might be applied to other charter or CPS schools to help match kids with colleges, and he said he met Mayor Rahm Emanuel's new initiative Thrive Chicago to see if he can help make that happen. "It’s about a young adult making a decision about the rest of their life," Niksch said. "So we want to help them with that process."